Purple Essentials is making it easy to communicate with us. We are eager to share information with you and, in turn, receive your invaluable feedback. 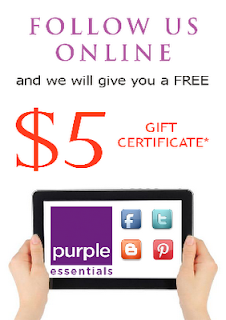 To thank you for signing on to one or more of our social media options, Purple Essentials would like to offer you a Free $5 Gift Certificate. Step 2: send an email to followuspromo@purple-essentials.com including your name and which account you joined. Once your registration is confirmed, we will email you your unique $5 Gift Certificate code for our website ... it's that simple! Question: Can this code be combined with other Purple offers? Answer: Absolutely! 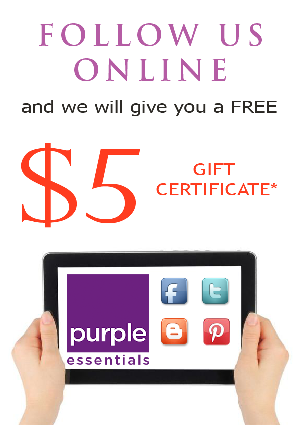 Purple Essentials will be running a number of promos this Fall season and this code is as good as a $5 bill. Simply type the code we provide you into the Coupon Code box on our shopping cart page, and your total will be reduced by $5. If you have received another, different promo code then you may enter it as well. Question: What if I am already a Purple Essentials follower? Will I qualify for this promo? Answer: Absolutely! Skip to Step 2 and follow the instructions to confirm your current registration with one of Purple Essentials' social essentials. We will happily process your free gift ... thank you for following us! Limit 1 Free $5 Gift Certificate per customer. Limit of 1 Free $5 Gift Certificate redemption per online order. I hope those of you who have been following our progress thus far, have enjoyed witnessing the evolution of our company ... thank you for your support, comments and, especially, your purchases! Things are getting exciting!! For those just now discovering Purple Essentials ... Welcome!! Purple Essentials combines the natural science of aromatherapy with pure and simple ingredients from around the world, to offer you fresh and natural products with long lasting benefits. Each one of our personal care products is handcrafted in small batches, using nourishing ingredients and pure essential oils. Our extensive line of natural products has something for everyone ... including a recently released line of premium Baby products.